In 1891 Cross moved from Paris to the Côte d’Azur. He suffered from rheumatoid arthritis and hoped that the warmer climes of the south would ameliorate his condition. At first he rented a house in the small coastal village of Cabasson between Toulon and Saint-Tropez. The intense luminosity of the Mediterranean Coast proved to be a turning point for his art. Although he had painted one beautiful portrait of his future wife in a divisionist style it was not until he arrived in the south that he took up the baton of Neo-Impressionism with some fervour. Here, three boys inhabit a scene of spectacular beauty. The intense blue of the unruffled sea contrasts with the various hues of orange used for the beach. 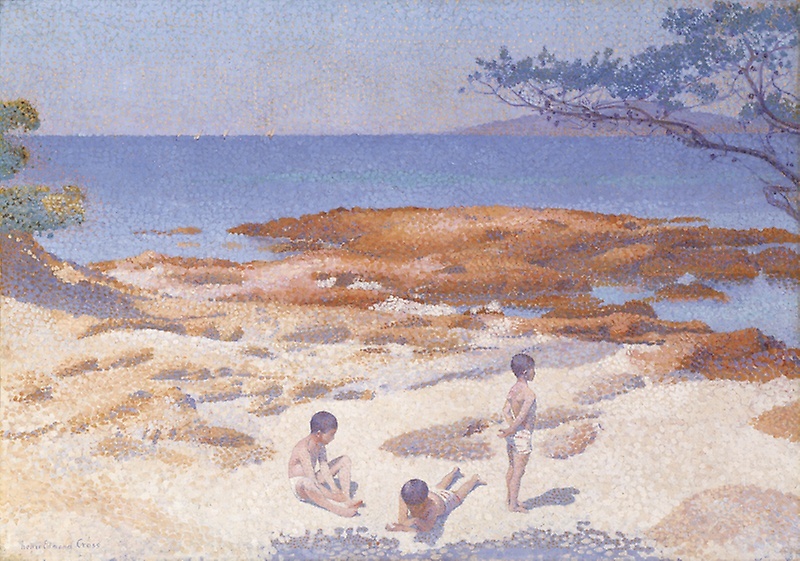 Cross wrote that he had used ‘harmonies of oranges and blues’, that favourite pointillist combination – an opposing pair in the colour wheel. In the sky he interjects dashes of gold in the azure sky in an effort to capture the exceptional qualities of Provencal light. It was paintings like this that chimed with increased tourism to the Mediterranean coast in the last years of the nineteenth century and indeed it was the area around Saint-Tropez that was especially popular with early tourists to the south. Realising that he had found his personal Arcadia, it was to the hamlet of St Clair near Saint-Tropez that Cross moved permanently in 1892. He encouraged his friend Paul Signac to travel to the south and when Signac arrived later that year in his yacht he immediately fell under the spell of the Côte d’Azur.